For almost 300 years, the Nuneham Courtenay estate, with its outlook over the River Thames and the Oxfordshire countryside, provided a welcome retreat for the Harcourt family and their illustrious visitors. At its heart stood Nuneham House; known today as the Global Retreat Centre. From the early 18th century until 1948, the 55 acres of pleasure grounds that surround the house were developed in sympathy with the interests of successive generations. Two 18th century Earls had a particularly strong influence on its landscape: Simon, and his rebellious son, George Simon. Through their efforts, the gardens followed, and at times helped to change, the tastes of the day. 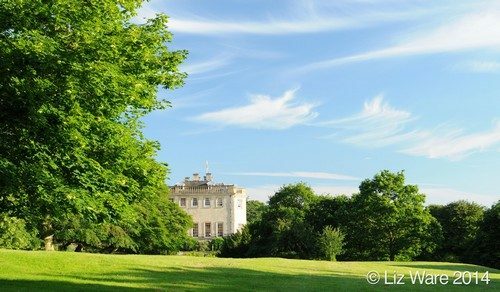 As a result, Nuneham Park has been described as being ‘of exceptional importance in the history of British landscape and horticulture’. In common with other educated early 18th century gentlemen, the 1st Earl Harcourt was interested in classical culture. To further his education he went on a Grand Tour of Europe where his tastes were moulded by the art and architecture he saw. One of the greatest influences was the work of the Renaissance architect, Palladio. Many of Palladio’s buildings reflected the architecture of the country villas built by the ancient Romans. Of a relatively simple design and set up in the hills, these villas provided a summer retreat from the heat and politics of Rome. Like many wealthy young men, Simon returned home wanting to create his own villa retreat in the English countryside. 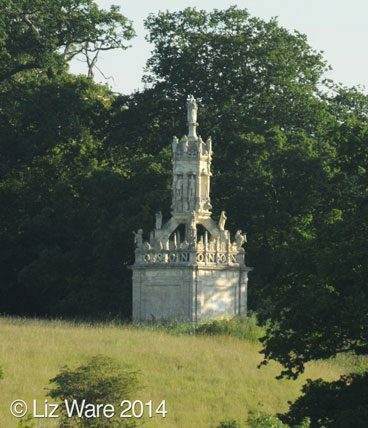 He had recently inherited the Nuneham Courtney estate, placed in just the situation that Palladio would have recommended: on top of a hill and with a navigable river below. It was deemed to be in an ‘advantageous and delicious’ position. ‘Advantageous’ the situation might have been, but the Earl wasn’t entirely happy. Fashionable landowners liked to have great sweeps of land extending out from their house that they could ‘enhance’ with neoclassical structures and garden ornaments. The Earl didn’t want his view interrupted by anything as inconvenient and untidy as a village. Consequently, the houses of Nuneham Courtenay were demolished and re-built on the main Oxford road. 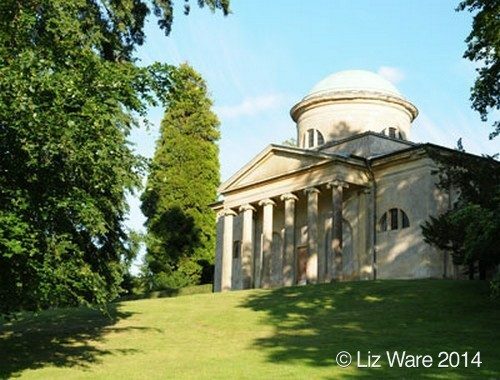 In 1764, Earl Harcourt knocked down the estate’s medieval church and replaced it with All Saints, the neoclassical church that we see today. It was one of the first churches to be built as a garden ornament. Paintings from the 1760s by the artist Paul Sandby suggest that the slopes leading down to the river were less wooded than today. This would have allowed the Earl and his visitors to enjoy the ‘arcadian’ views he had created. As a young man, the 2nd Earl, George Simon, rebelled against his father’s ideas. He had republican sympathies and would have nothing to do with the Court life in which his father played an important part. His taste in gardens was equally different. Rather than finding solace in landscapes that echoed the scenery of ancient Rome, he preferred the ideas of the French philosopher Rousseau. It was Nature, and flowers in particular, that inspired him. In 1771, while his father was working abroad, he created an informal flower garden with the help of the poet and gardener, William Mason. With its irregularly shaped flowerbeds, it’s difficult to imagine a greater contrast to the sweeping landscapes and classical architecture enjoyed by his father. It is said that the 1st Earl was less than impressed and, spitefully, had a laundry built overlooking the garden. William Whitehead, as the poet laureate and Harcourt family adviser, responded to the fracas with a poem, as he did whenever there was an event of any kind within the Harcourt family. Despite their differences, the father and son did share a talent for innovation. George Simon had, perhaps unwittingly, created the first informal flower garden. 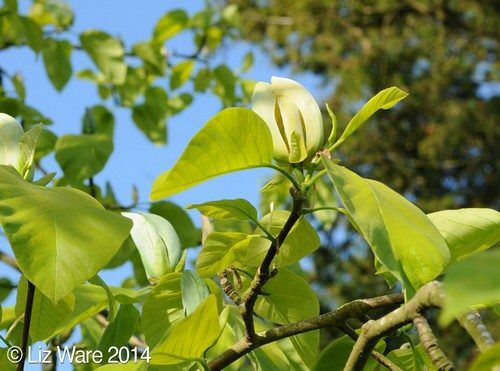 According to the late Mavis Batey, the eminent garden historian, ‘it was without precedent in garden history’. As far as the 2nd Earl was concerned, his new garden was rather more than a few random flower borders. Rousseau had written that ‘the study of botany will detach us from ourselves and lift us up to its Author’. It was this philosophy that Mason and the Earl hoped to express with their collection of flowers. It wasn’t until he inherited the house in 1777 that the 2nd Earl was able to make the pleasure grounds at Nuneham House entirely his own. A statue of Rousseau was placed firmly among the flowerbeds while the laundry that overlooked them was discretely screened. 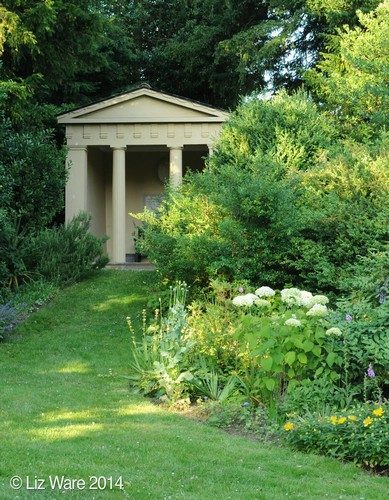 Inscriptions, busts of poets, and urns completed a garden designed to encourage ‘melancholy’ and contemplation. At its entrance, a Doric Gate was inscribed with a sentence from Rousseau: ‘Si l’auteur de la Nature est grand dans les grandes choses, il est tres grand dans les petites’ translated as ‘If the Author of nature is great in great things, he is very great in the small ones.’ As we can still see today, a Temple of Flora and a Grotto added additional layers of interest. The 2nd Earl’s alterations were widespread. He hired the great landscape designer, Capability Brown to make changes to the house and to improve the landscape. It was to be one of Brown’s last commissions. Trees were thinned and woodland and river walks were created. The oak under which poet William Whitehead sat while awaiting inspiration is still marked on ‘Brown’s walk’ today. The changes that Brown made to the landscape at Nuneham Courtenay were relatively small. As the 1st Earl had realised, the estate was so perfectly situated that there was no need for the shifting of enormous quantities of soil or the creation of vast areas of water that Brown was employed to do on other estates. By the late 18th century, fashionable taste in landscape was changing. The 2nd Earl was a great supporter of the Reverend William Gilpin whose ‘picturesque’ ideas were becoming increasingly popular. Besides encouraging Gilpin with his work, George Simon also wrote a guidebook to Nuneham Courtenay using a style similar to that of Gilpin’s famous ‘Tours’. Gilpin looked at landscape in a particular way. He liked to capture views, framed by trees, as if they were landscape paintings. With the help of William Mason, the 2nd Earl planned the replanting of the area to the north of the chapel on these ‘picturesque principles’. Capability Brown had indicated to George Simon the perfect position for an ‘eyecatcher’ in this ‘picturesque’ landscape. When the 2nd Earl was presented with the Carfax Conduit (recently removed from the centre of Oxford) he knew just where it should be placed. It continues to catch our eye from many points in the Nuneham landscape today. Marriage and maturity mellowed the 2nd Earl. By 1786 he had abandoned his republicanism and welcomed George III and Queen Charlotte as visitors. 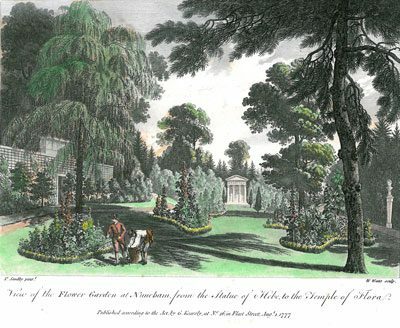 The pleasure gardens that he and his father had created together continued to attract attention and were admired by the most prominent artists, writers and social commentators of the day. The next Harcourt to make an impression on the grounds was Edward Vernon Harcourt, Archbishop of York, who inherited in 1830. He removed the statue of Rousseau from the flower garden and commissioned William Sawrey Gilpin, nephew of ‘picturesque’ Rev William Gilpin to make improvements. He bought extra land along the Oxford turnpike where Gilpin layed out a ‘Pinetum’, creating changes that Queen Victoria may have admired when she stayed shortly after her wedding. The archbishop’s younger son the Reverend William Vernon Harcourt inherited the estate in 1861. A Fellow of the Royal Society, he made many new plantings in the park and arboretum, perhaps with the help of his friend and colleague, Charles Daubery, Keeper of Oxford Botanic Garden. 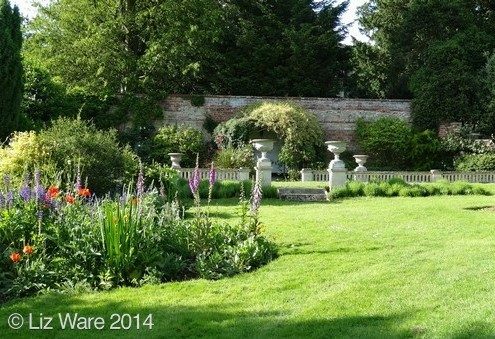 The grounds at Nuneham Courtenay continued to delight visitors just as much as it had in the previous century. Its setting was the inspiration for several chapters of Lewis Carroll’s ‘Through the Looking Glass’ and ‘Alice in Wonderland’. The Reverend’s grandson, Lewis, 1st Viscount Harcourt, was the last Harcourt to make major changes to the estate. He was a friend of Gertrude Jekyll and William Robinson whose ideas on planting were very popular in the early 20th century. Lewis, inspired by Robinson’s ‘Wild Garden’ created a woodland garden on the lower slopes of the estate. 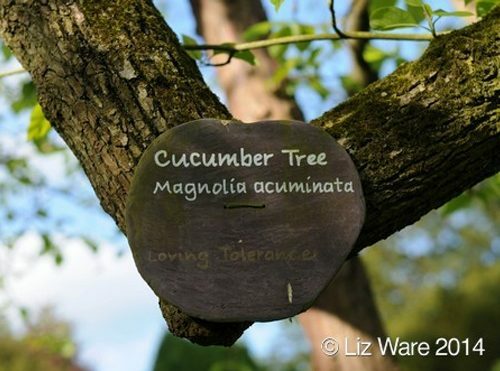 Rare trees and hardy exotics were naturalised along a stream and linked to the rest of the garden by a rock walk. 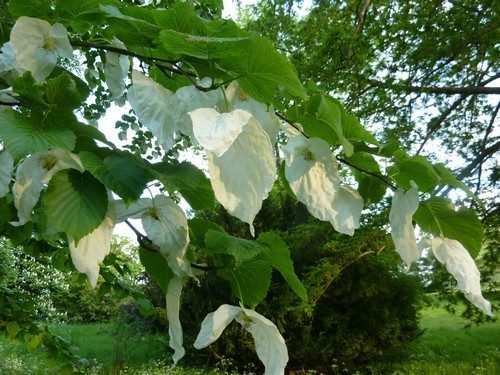 Perhaps he was responsible for planting some of the many beautiful specimen trees that we enjoy today, such as the magnificent Cucumber tree (Magnolia acuminata) and the Handkerchief tree (Davidia involucrata). In 1942, and during Sir William Harcourt’s ownership, Nuneham House was requisitioned by the RAF and used as a Central Interpretation Unit for air surveillance photography. Sir William sold the estate in 1948 to the University of Oxford who leased it to a succession of tenants. 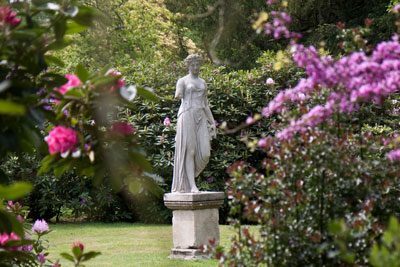 Since the early 1980’s, under the watchful eye of Richard Bisgrove, garden historian, university lecturer and author, a great deal of restoration work has taken place in the 2nd Earl’s flower garden. The intention was to bring this space back to the look and feel of the late 18th century, as recorded in a series of paintings by Paul Sandby. The majority of the irregularly shaped flowerbeds have been planted with flowering shrubs for ease of maintenance. However careful research and referral to contemporary poems, letters and paintings, has enabled the island beds to be planted much as the 2nd Earl might have done himself. 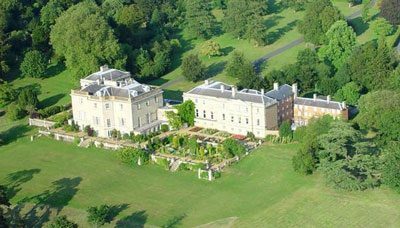 Since 1993, Nuneham Courtenay has been the home of the Global Retreat Centre. Very much in keeping with the designs for the 18th century landscape, the grounds continue to be an integral part of the meditative and contemplative focus for the retreats and seminars hosted by the Centre today.